Happy New Year y'all! This post has been a long time coming. After months and months of rigorous testing and stuffing my face with buttermilk biscuits (I know, tough life) I finally perfected my recipe and shared a biscuit making tutorial on Twitter, which was later Storified. Many of my followers have been using it as a reference and made some great biscuits, so it was time to make things official and bring it on home to my blog. If you ask ten different people what constitutes the "perfect" biscuit, you'll likely to get a variety of answers, mostly due to regional preferences. 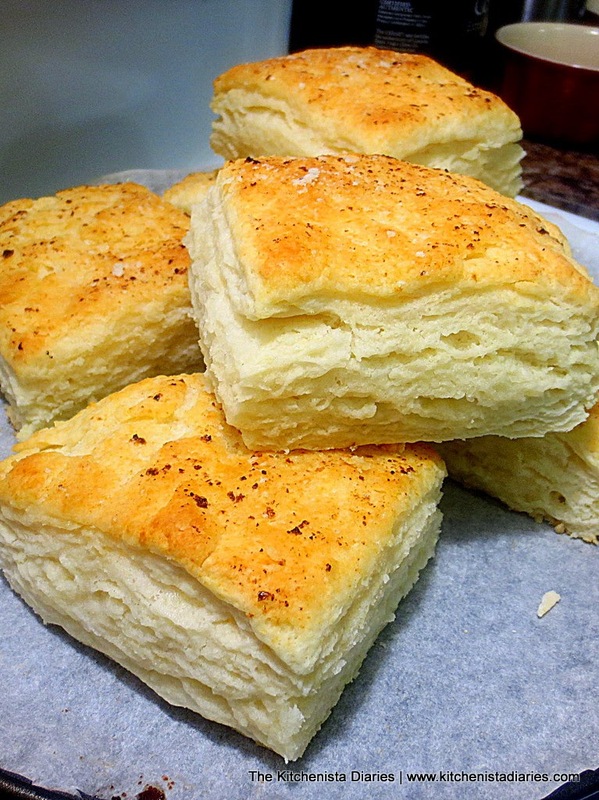 The battle between the North and the South when it comes to biscuits is about as fierce as the one over cornbread. 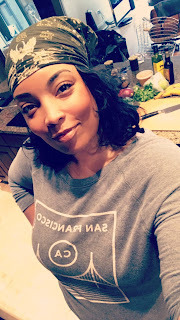 I grew up in Northern Virginia for most of my adult life but as an army brat who picked up habits from all over the place, I make no claims to being a homegrown southern cook. I didn't even try to make biscuits until I was well into my 20's, and those early attempts were certainly nothing I would serve today. My biscuit preferences are likely a hybrid of sorts - fluffy and flaky, tender with a slight crumb. Sometimes I want the golden crusty tops and bottoms that only a cast iron skillet can provide; other times I want to create softer pillows of buttery perfection on a baking sheet. 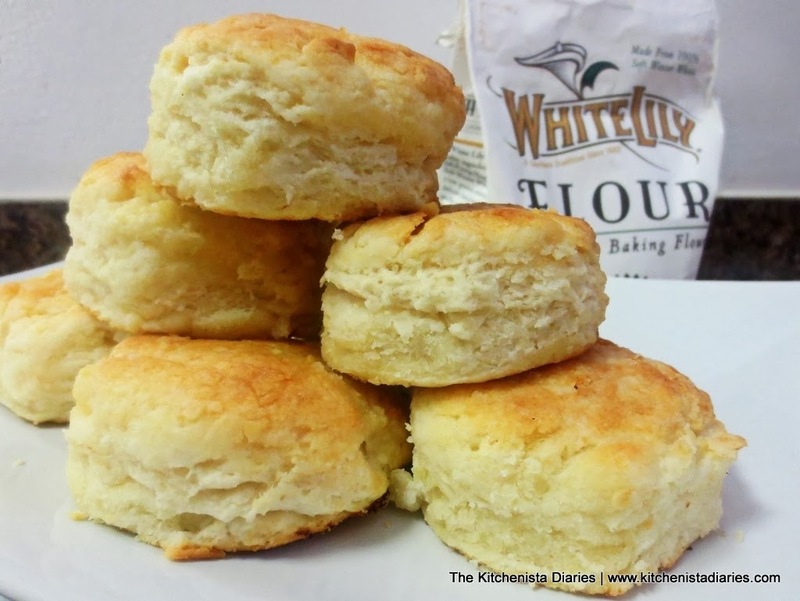 However, when it comes to the most important ingredient in buttermilk biscuits - the flour - I will say that my feet are planted firmly in the South as a White Lily fanatic. I'll get into that in more detail below. The rest of the ingredients are basic to any biscuit recipe - buttermilk, butter, shortening, leaveners and salt. Please note, the proportions are specific for the recipe as written, so I can't guarantee the same results with substitutions. If you're looking for a vegan recipe, try the coconut biscuits featured in my previous post for Strawberry Shortcake. If there is anything I wanted to check off my list as an avid home cook, it was learning how to make great buttermilk biscuits. Yes, it's convenient to pop open some canned dough...but when you realize just how easy it is to make fresh homemade biscuits yourself, you'll wonder why you waited so long. These are the real deal. What you'll find in this post is a basic, reliable buttermilk biscuit recipe with plenty of tips to help you perfect your technique. So roll up your sleeves, prepare to get a little messy, and get ready to practice until your biscuits are perfect too! I'm also now realizing that I failed to let my blog readers in on a little news of my own... I am in fact expecting another future Kitchenista! My baby girl, quite appropriately nicknamed "Biscuit" by my Twitter followers, is due in April and I couldn't be more excited to meet her in a few months! Rumor has it on Twitter that these biscuits are good enough to bless you with babies...so be careful who you serve them to! 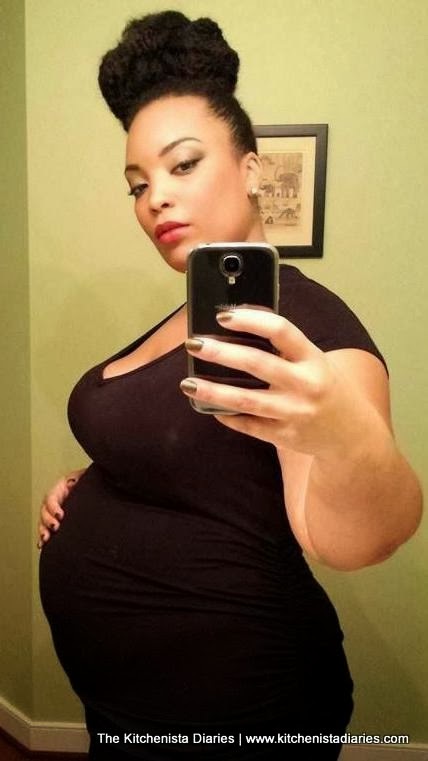 #PregnancySelfie! That's Biscuit in there! *1 cup cake flour + 1 cup regular AP flour can be substituted if White Lily is unavailable. **Update: If you're unable to find full fat buttermilk, substitute 1/2 cup of low fat buttermilk and 1/2 cup heavy whipping cream. I'm a bit of a nerd at heart, so I like to research new things before I dig in. 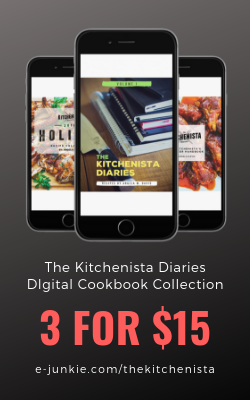 I've found that understanding the why's and how's of cooking has really improved my technique and allowed me to improvise with ease because I know what will or won't work. Biscuits aren't rocket science by any means, but for such a simple recipe there's actually a lot of elements working together behind the scenes. The better you understand each one, the better you'll be at baking biscuits. I promise you that much. So take a few minutes before you get started and read the notes below, explore the links provided and let all this fun info sink in. Biscuit making is equal parts ingredients and technique, so I hope you find it all helpful in perfecting them in your own kitchen! As I mentioned above, my flour of choice for biscuits is White Lily. It's a light flour made from the soft winter wheat grown in the South. For that reason, if you live outside of the southern United States, you may not see it on shelves. It is however available for purchase via Amazon.com, so feel free to utilize that option as well. Make sure that you don't grab the self-rising flour though, that won't work with this recipe. I actually don't use self-rising flour for anything anymore, because I find it to be too much of a hassle to adjust recipes for the proper amount of baking powder and salt. What makes White Lily perfect for biscuits is that it is low protein, which means less gluten will form when wheat flour and water meet to create dough. I'll save you from the extended science lesson here, but if you're interested, Fine Cooking breaks it down pretty well. Bottom line, less gluten translates to lighter, softer biscuits. That also means White Lily is the perfect flour for fluffy pancakes, tender cornbread, crispy fried chicken and a myriad of baked goods, so I highly recommend adding it to your pantry. If you simply can't find it, the closest substitution that I've tested has been a mix of 1/2 cake flour, 1/2 regular all-purpose flour (so for this recipe, 1 cup each.) That will produce softer biscuits than straight AP flour can alone. Regarding the buttermilk, I do use full-fat for baking biscuits, cakes, making pancakes & waffles, as well as salad dressings. Some grocery stores only carry the lower fat version but you really don't want that if you can avoid it. I tend to only use the lower fat version for marinades. You may have heard of creating a buttermilk "substitute" by adding a teaspoon of vinegar or lemon juice to a cup of milk and letting it sit until thickened. I'm gonna tell you right now that I have tried it in emergencies, and don't think it yields the same results. The acidity in real buttermilk reacts with the leavening agents to make your biscuits rise, and also contributes flavor and texture. 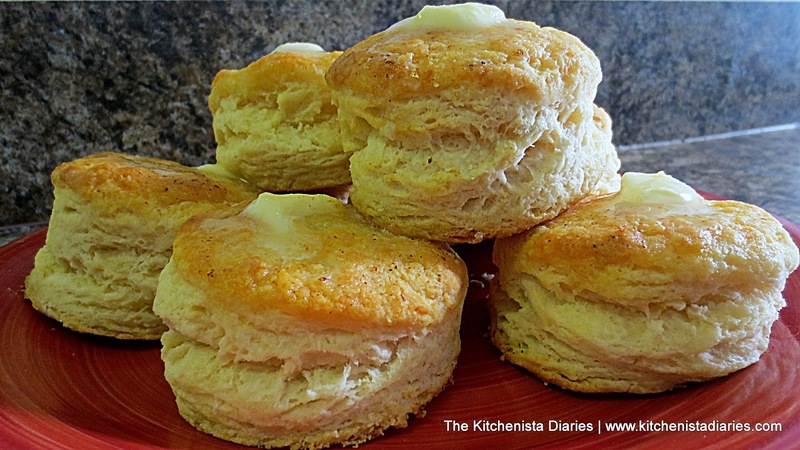 In my opinion, the flavor and viscosity of vinegar & milk just doesn't cut it for me in standard buttermilk biscuits. My recipe also calls for European style butter. Commonly sold brands in most grocery stores are Plugra and Kerrygold Irish Butter. Yes, they are both a little more expensive than "regular" butter but the trade off is flakier biscuits. Why? European style butters have a slightly higher fat to water ratio than the regular stuff. Less water means less opportunity to create that tricky gluten we discussed earlier. I also prefer to use European style butter for pie crusts for the same reason. It's not a total deal breaker if you get regular unsalted butter, but I say go hard or go home. Flour, butter and buttermilk are your key components, so you might as well use the best quality ingredients and get the best results. The other fat used in this recipe is shortening. It's something you'll rarely see in my recipes but it does serve a purpose at times. In this case, it helps to create a more tender biscuit than butter would alone. Shortening adds tenderness, butter creates the layers and flavor. That's why these biscuits are the best of both worlds. Yes, it's a processed ingredient that I wouldn't normally recommend, but we're just talking a few tablespoons for the whole batch. I don't care for all-shortening biscuit recipes because they tend to leave a filmy aftertaste in my mouth after eating (have you noticed that with fast food biscuits? It's the shortening.) My suggestion is to buy the butter flavored shortening sticks that Crisco makes. I keep a stick in the pantry and a stick in the fridge, so that I'm ready for any random usage of shortening when cooking. There's a few different ways you can go about following this recipe, depending on whether or not you want to drag out your food processor. You will ultimately need to finish the biscuits by hand, so this is truly a matter of convenience for a couple steps. Once you get good at this, I'll doubt you'll find a reason to use one at all! Regarding utensils, plenty of home cooks get by just fine using two knives and a cup and there's nothing wrong with that. If you plan to make biscuits often though, a pastry blender and set of biscuit cutters are great tools to have on hand. They typically cost less than $10 each. Ready? Let's make some biscuits! To prep for biscuit making, you'll want to preheat your oven to 475° F and line a heavy baking sheet with parchment paper. Chill 6 tbsp of butter, a mixing bowl and any metal utensils in the freezer while you gather the other ingredients. Your buttermilk should remain in the fridge until needed so that it stays cold. Melt the remaining 2 tbsp of butter and set aside. If you're starting out by hand, whisk together the flour, baking powder, baking soda and salt. 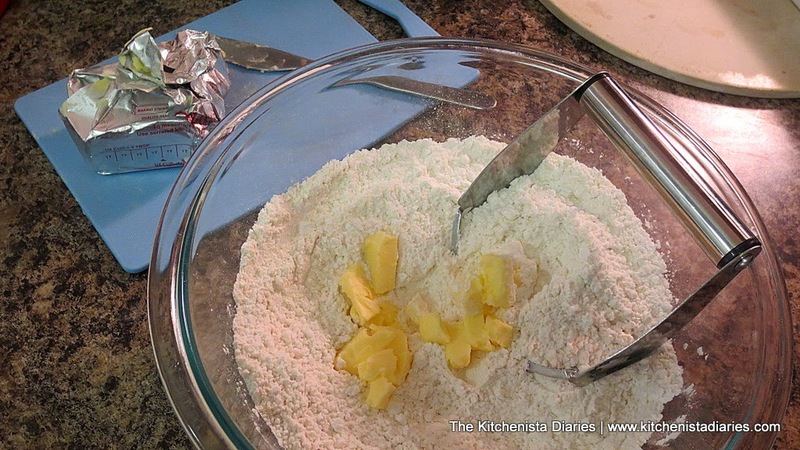 Cube the shortening and cut it into the flour using a pastry blender. To do that, hold the pastry blender by its handle and press the tines into the shortening, using a twisting motion as you work around the bowl. 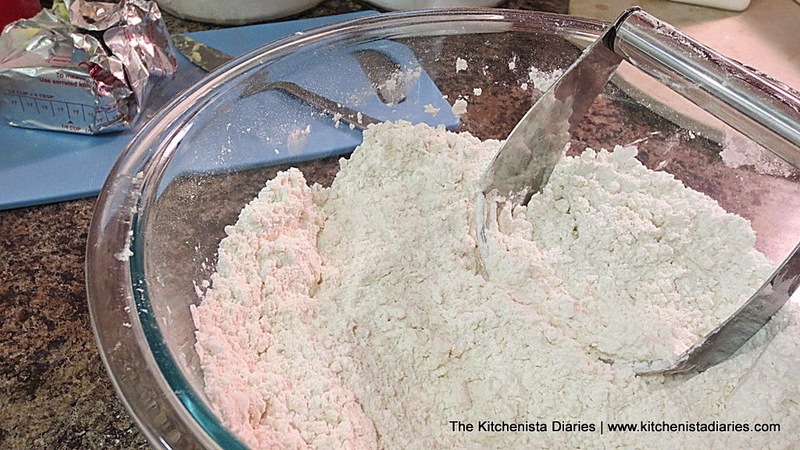 Continue cutting the shortening into flour until the mixture resembles coarse sand. If you're using a food processor, pulse together the flour, baking powder, baking soda and salt. Cube the shortening and add it to the flour mixture. Pulse a few times until the shortening is incorporated and flour resembles coarse sand. The next step is to cut the butter in. Remember to always work with chilled butter. From this point on, you don't want the butter to melt at any point in the biscuit making process, so keep everything as cold as possible. If I get distracted by a phone call or my son needs me, I stick the whole bowl back in the fridge until I return. 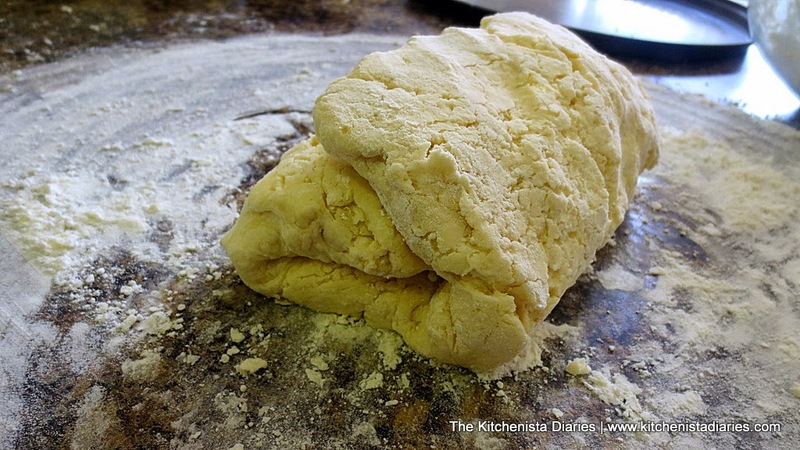 The way you cut in your butter will determine how flaky your biscuits will be. 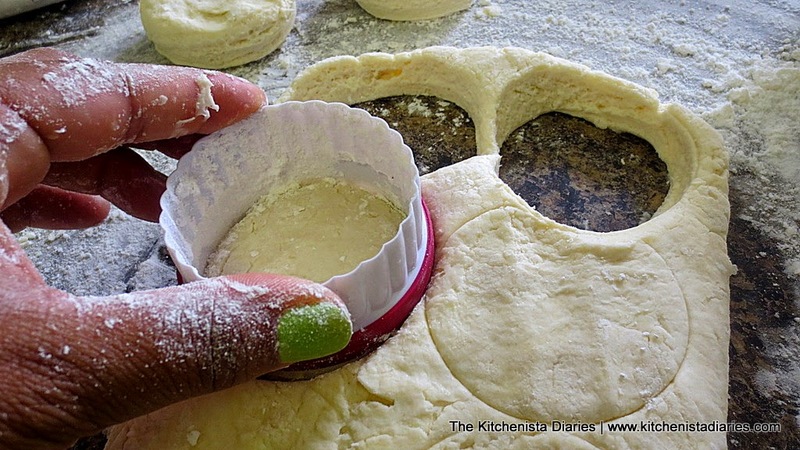 Traditionally, you can continue to use the pastry cutter just like you did with the shortening. 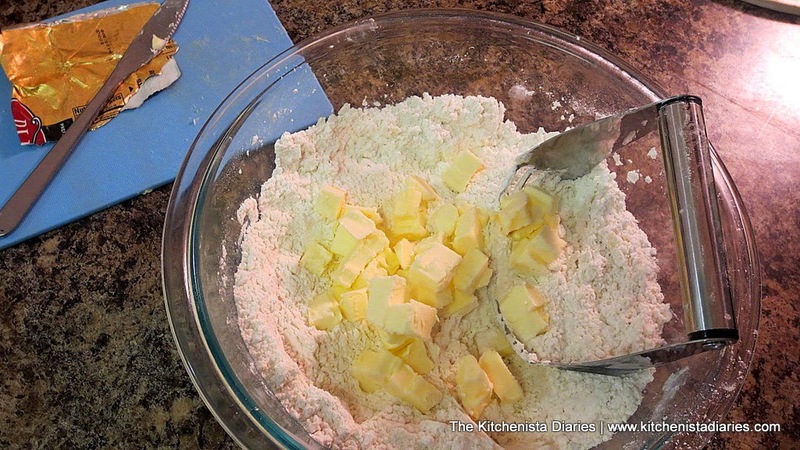 Cube the frozen butter, and cut it into the flour until small chunks or pebbles are dispersed throughout. But wait...there's a few other alternatives depending on how fancy you want to get. When butter melts, the water in it turns into steam which raises the dough, creating layers within the biscuit. For the best layers, instead of little chunks of butter throughout, you ideally want large flat flakes of butter. This is also true for flaky pie crusts and other pastries. One way you can achieve that is using your food processor and a chilled shredder attachment. I coat my butter with a little bit of the flour first to prevent it from sticking together as much. You really need to have butter that's frozen solid for this to work well. Be sure to scrape excess butter off the shredding disk so you don't lose any of it. 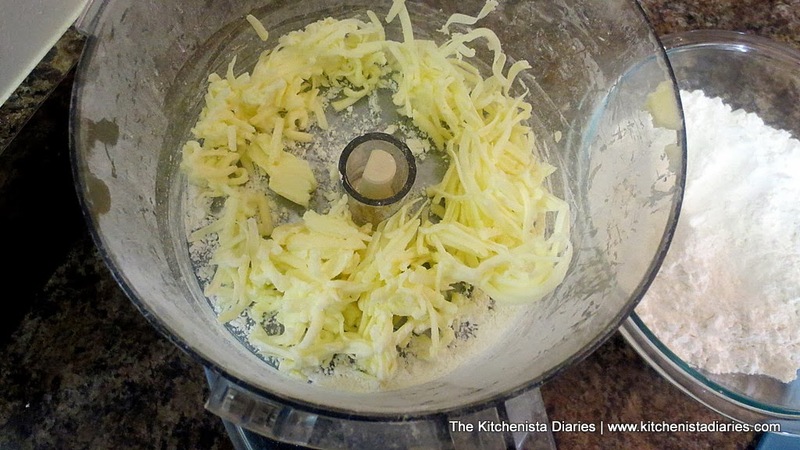 If you aren't using a food processor, shredding the butter with a box grater works too. 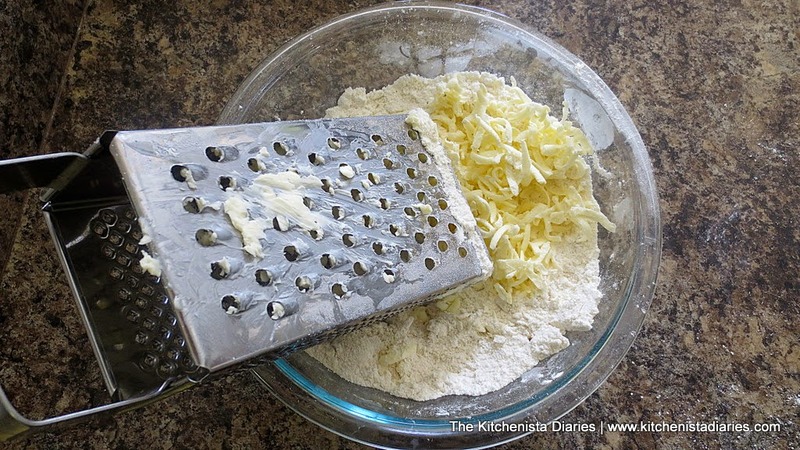 Just be careful not to melt the butter with the warmth of your hands as you grate it. 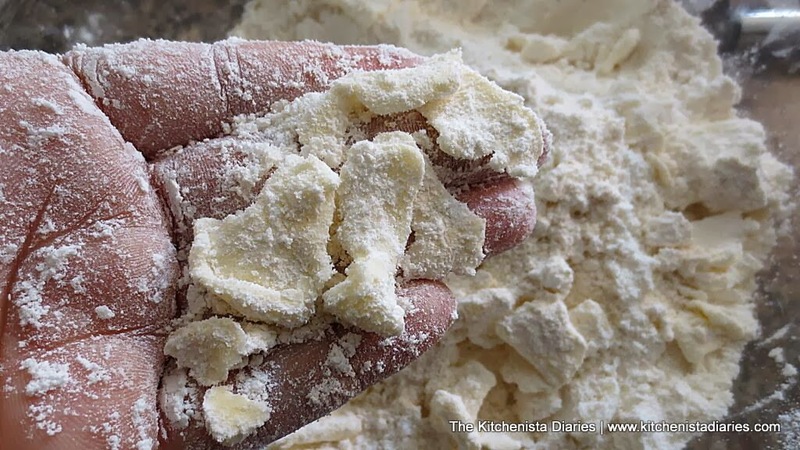 After the butter is cut into the flour, you should be able to see the little chunks or flakes throughout, depending on which method you used. 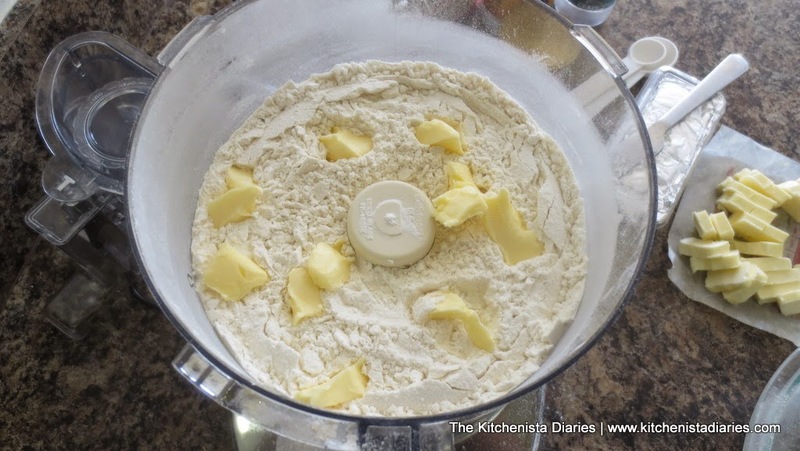 The reason why we don't use a food processor for that step is because it would too finely disperse the butter. At this point, you may want to stick the bowl back in the fridge for a few minutes if you feel like the butter has started to melt a little, especially if you used your hands to cut it. Now that the fat is incorporated, it's time to add some liquid. 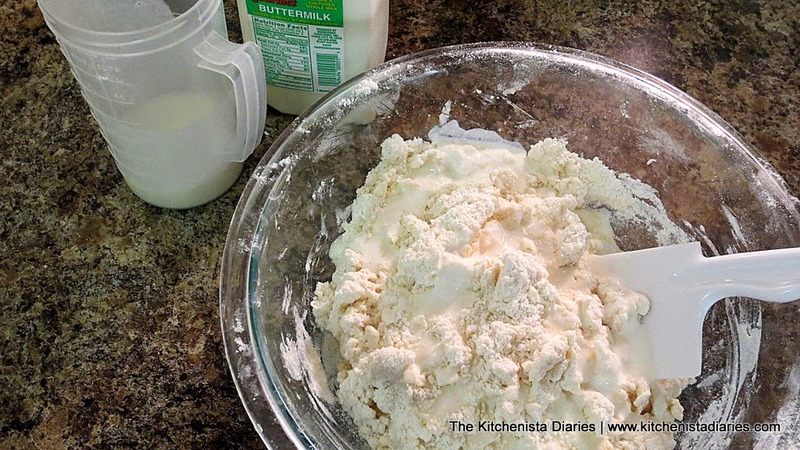 Slowly add the chilled buttermilk into the flour while mixing very gently to incorporate. I like to use a silicone spatula here. You may not need a full cup of buttermilk, so stop at around 2/3 cup to check how it's coming together. 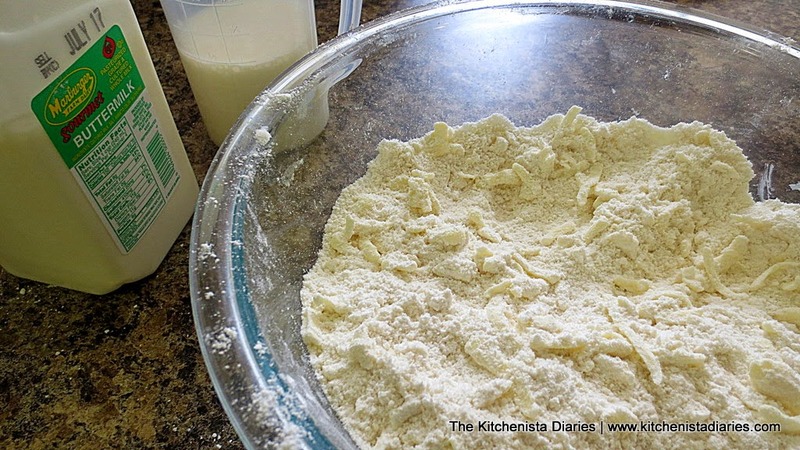 You want just enough buttermilk so that the dough forms and can be pinched together with your fingers. That tends to fall somewhere between 3/4 cup and 1 cup of buttermilk for me. It'll look like a mess at this point and possibly a bit loose but don't worry. Don't add more buttermilk than what's needed, as you can't simply add more flour to fix it. This part is somewhat intuitive but the more you make biscuits you'll recognize what to look for and how things should feel. Prep your work surface with a light coating of flour. Another trick here is to lightly spray the counter with a little nonstick cooking spray, then use a paper towel to smear it evenly over your work surface. Then coat that with flour. The cooking spray helps the flour to stay in place! 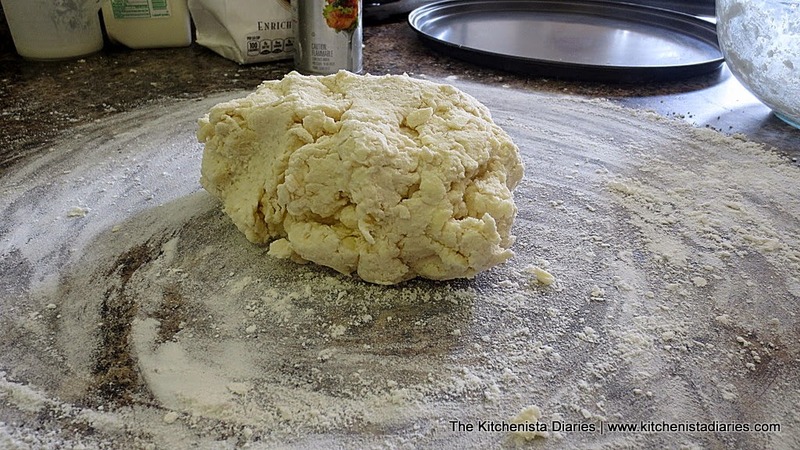 Turn your biscuit dough out onto the work surface. Using floured hands, gently form it into a large ball. You're not kneading the dough, just gathering it together. This is where you'll see it start to come together. If you're using White Lily, you'll notice how soft and tender this dough is compared to regular flour. Treat the biscuit dough gingerly. This isn't bread or pasta dough. You want to minimize the amount of gluten formed and prevent the butter from melting. Overworked biscuit dough results in tougher biscuits. 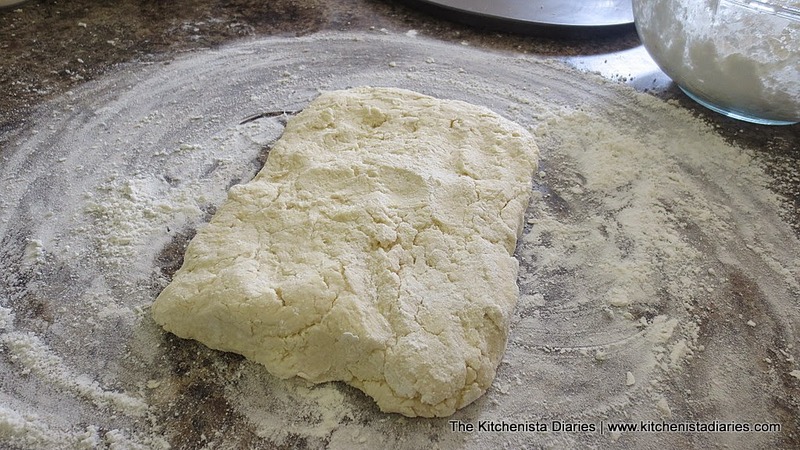 Gently press the ball of dough into a large rectangle, about 9 inches long by 6 inches wide. 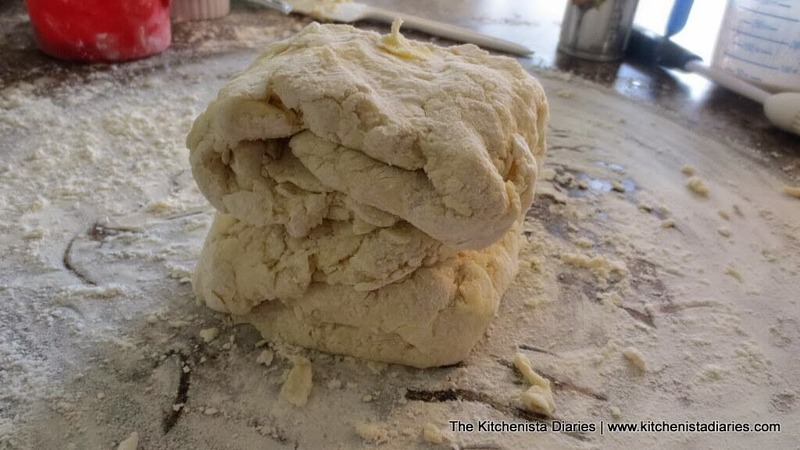 It might barely seem like it's holding shape, but as you continue to work with it, the dough becomes more pliable. 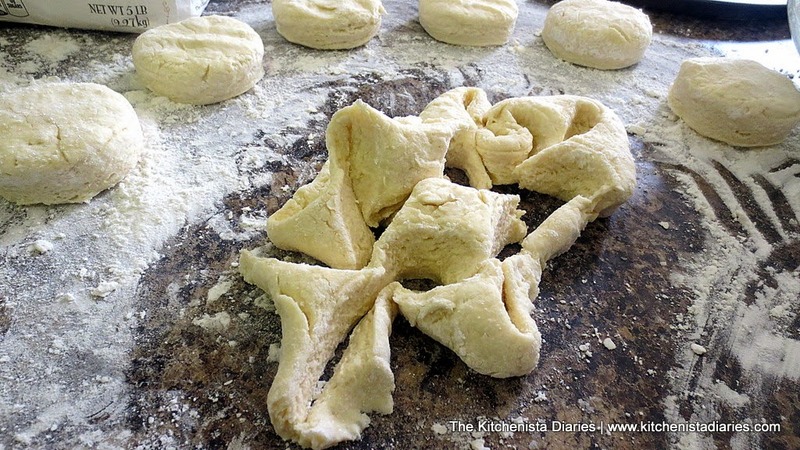 Fold the dough into thirds, much like you would fold a letter to fit an envelope. Just fold each end towards the middle, one overlapping the other. Now fold this onto itself in half, creating a stacked square. 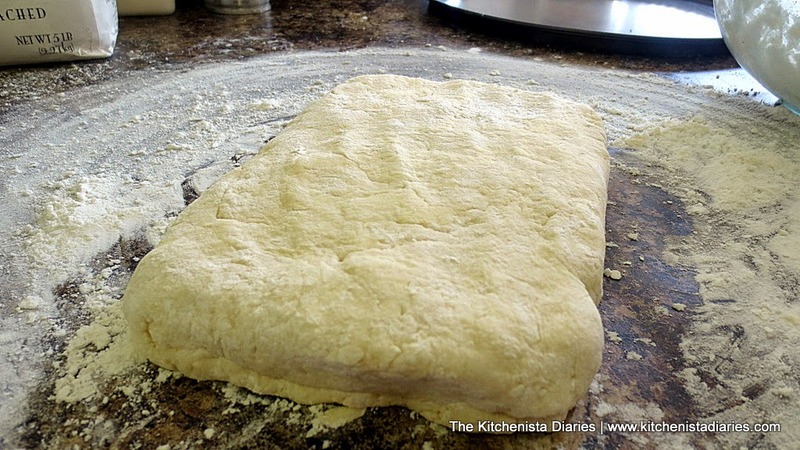 Gently press all the dough back down into a rectangle similar to the size you started with in the first step. It should be about 1/2" thick. You've just created layers within the dough! Once you've gotten a feel for things, you may be able to repeat the layering process without overworking the dough. I suggest stopping here the first few times though. This may sound like a lot of steps but in reality you're working quickly here. 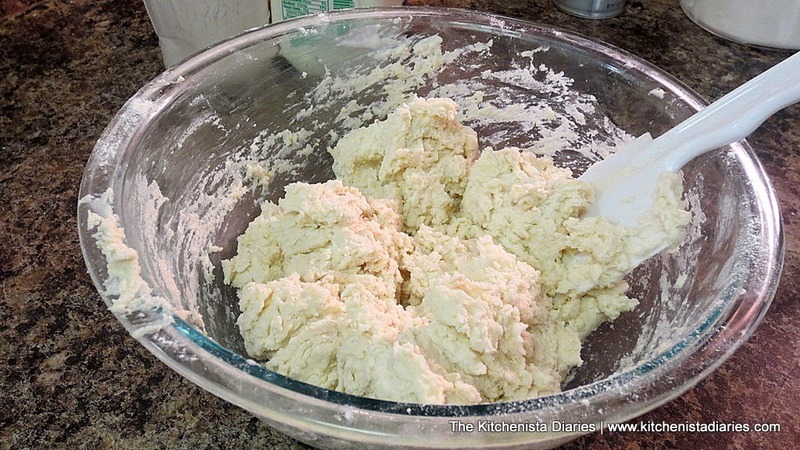 Remember, the idea is not to let the dough come to room temperature otherwise the butter starts to melt too soon. I use my biscuit cutter to measure the size of my rectangle so that I can get 6 biscuits cut out of it in the first round. These will be the best looking biscuits. We'll use the scraps as well, but they rarely come out as good. 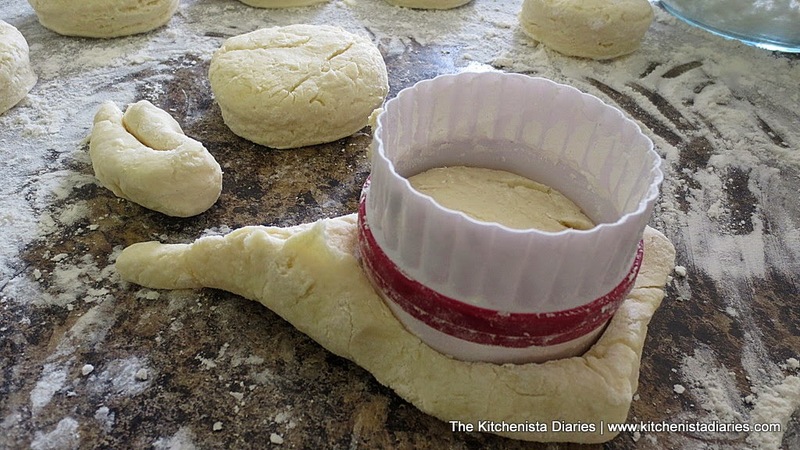 Using a floured biscuit cutter, press straight down into the dough and straight back up. Don't twist it. Just pop the circle of dough out with your hand. Twisting the cutter seals those pretty layers you worked so hard to make! Continue cutting out the first 6 biscuits. Gather the scraps together and gently push them back into a smaller rectangle shape. I fold it once or twice just in case any layers were lost. You should be able to cut out 2 more biscuits from the scraps. The remaining scraps can be tossed, used for dumplings, or pressed by hand into a makeshift biscuit depending on how much you have left. It'll probably look ugly compared to the others, but it'll still taste the same! 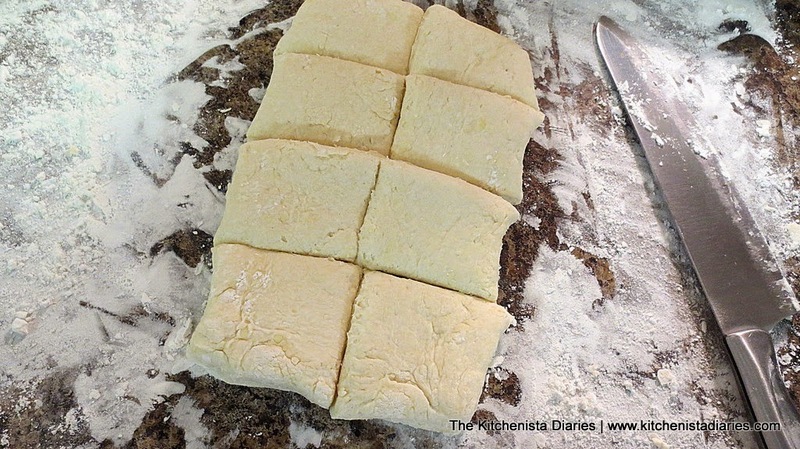 If you would like to make the most out of your biscuit dough and/or don't have biscuit cutters, another way you can cut biscuits is into squares. 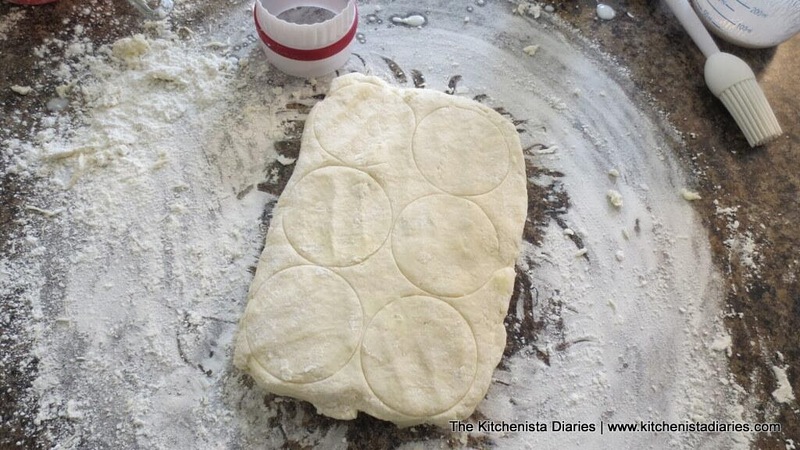 Simply use a sharp chef's knife or pastry cutter to slice straight down through the dough to create 6 to 8 squares. Much like using a biscuit cutter, no sawing back and forth. Easy thing about square biscuits is that there's no scraps! Transfer the biscuits to a parchment paper lined baking sheet. 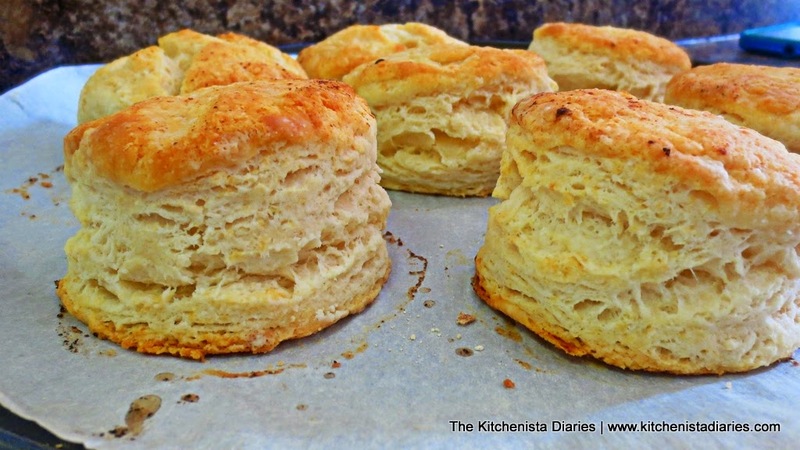 If you like soft biscuit sides, scoot the biscuits next to each other so that they just barely touch. If you like crisper sides, arrange them an inch or two apart. 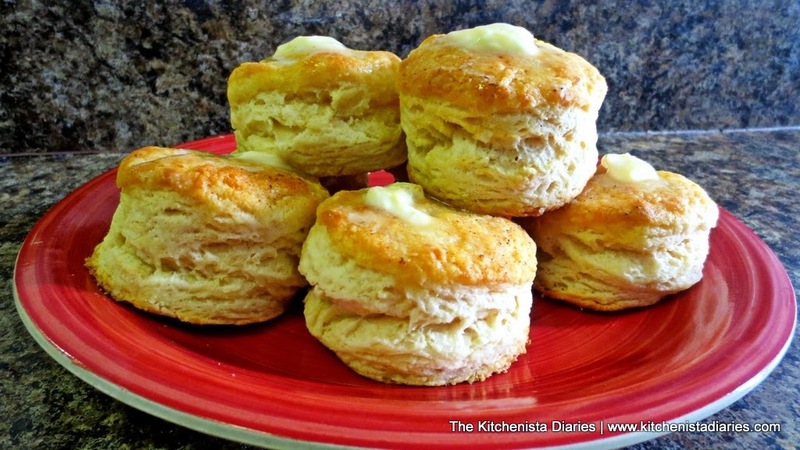 Brush the biscuits lightly with melted butter. For softer shiny biscuit tops, you could brush with buttermilk instead. Alternatively, you can prepare crustier biscuits by preheating a cast iron skillet while you're making the dough. When you're done cutting the biscuits, melt a little butter in the hot skillet and arrange your unbaked biscuits just barely touching each other. Brush with butter or buttermilk as above. Transfer the baking sheet to the oven, middle rack.Resist the urge to open the oven while they are cooking or you'll lose heat and potentially deflate them! 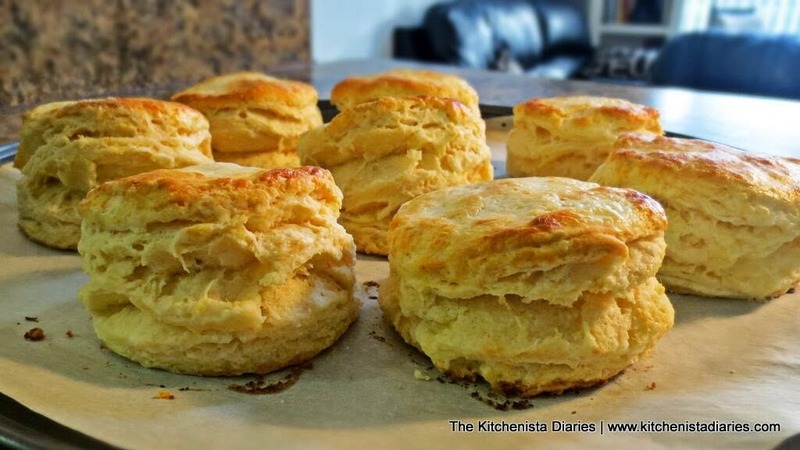 Bake at 475° F for 10 to 12 minutes or until the biscuits are golden brown. When they're done, remove and transfer the baking sheet to your stove top or wire rack to cool. Mmm. Biscuits. 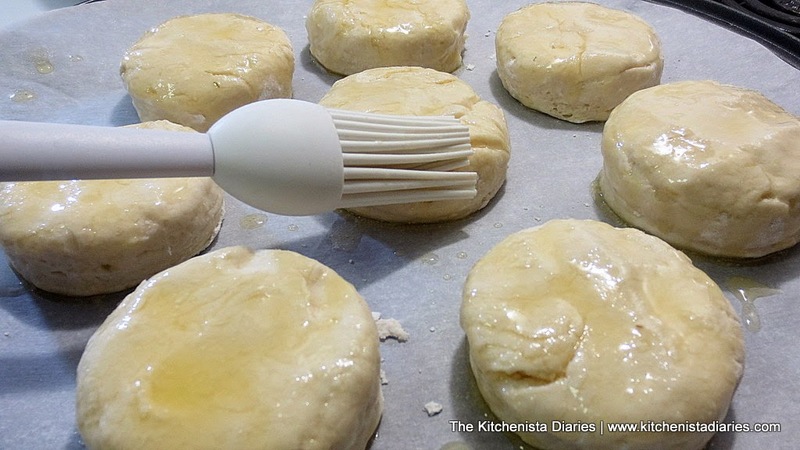 Brush the cooked biscuits with additional melted butter (because...why not?) and try to let them cool just enough that you don't scald the roof of your mouth. I never seem to be able to wait long myself, but I figured I'd suggest it for safety's sake! If you made square biscuits, they'll look something like these. Lovely flaky layers, a little less fuss! My favorite way to eat biscuits is with a little (okay, a lot of) honey drizzled over the top! I never seem to get a picture of this moment though, because who really wants to let biscuits get cold while you could be eating them? Not this girl. Whew. So there you have it. That was my exhaustive, Perfect Buttermilk Biscuits tutorial. Don't be intimidated by the process or the practice it may take you to get them just right. I can whip these babies out in no time these days, no worries. Best part? Turning your nose up as you walk past the canned biscuit section of the grocery store knowing those days are long gone! These... are the best biscuits I've ever made hands down. So easy to make too! Thank you!